Neato Coolville is a place filled with Tiki motels, wax museums, penny arcades, haunted house attractions, and glowing neon signs. There’s a 25-foot Mr. Muffler on Main Street, tailfin cars at the Drive-In, and Korla Pandit is playing the local lounge every night. It’s where old toys go to retire. Not the kind of mint-in-the-box, museum quality, collector’s don’t-touch-‘em toys, but the real, storied ones, the ones that were played with, like the Remco Frankenstein Action Figure beautifully photographed above, proudly wearing its scuffs and scrapes. Neato Coolville is the very appropriate name of “Mayor” Todd Franklin’s blog. It’s a great stop for the nostalgic — you’ll rediscover those Star Wars bubble gum cards you collected as a kid — but this is also pop culture archeology, a repository of essential art, once mass-produced and ubiquitous, now rare or out of style, offering a spellbinding glimpse into the fast-fleeting past. Clicking around Todd’s blog, you’ll find plenty of Frankenstein fun, including a giant axe-wielding statue in Burbank, and a stopover in — of all places — Frankenstein, Missouri. For sheer Pop Frankenstein ecstasy, check out Neato Coolville’s Monsterville photoset on Flickr, full of toys, comic book ads, posters and novelties. You know, I wonder sometimes what Mary Shelley would make of, say, a Frankenstein Pez dispenser. oh, that is so cool. Indeed! It's a beautiful photo and the little fellow shows a great deal of dignity. i couldn't find it on the original site though, when i was looking for more. 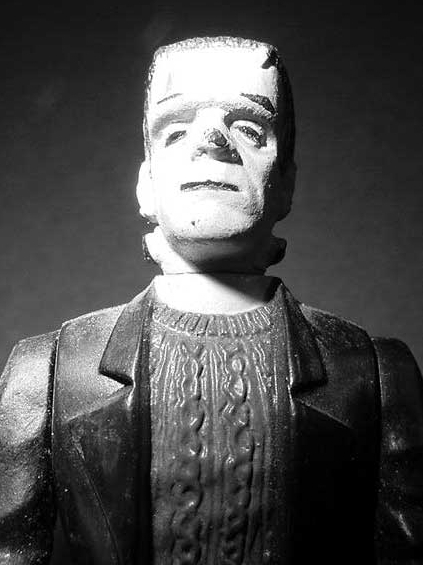 You can find that wistful Frankenstein figurine on Neato’s Flickr set, which I linked to. Thanks for visiting, Shahn. Your “Six Martinis and the Seventh Art” is one of my most favorite places on the net. you are the sweetest! i like your blog too, i'm directing my horror movie friends to it. thanks for the flickr info.